In a galaxy far, far away... It is period of noodle unrest. 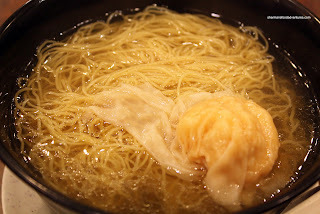 Rebellious restaurants, striking from different places, have lay claim to the best wonton noodles in town. That's right, its epic and legendary. In fact, it's a saga, in the form of McKim Wonton Mein Saga. When it comes to wonton houses, you have the "good" with Nancy Wonton House, McNoodle and Ho Yuen Kee. Then you have the "bad" with On On Wonton House, Hon's and Penny. For wonton supremacy, we see the pure all-shrimp versions vs. the evil pork wontons. Yes, some people are drawn to the dark side since they don't like shrimp. Fair enough. But pe rsonally, I'd prefer to chill with "The Force". After helping out Costanza move some things and hook up his computer, we all headed out to a nearby galaxy, er... restaurant. 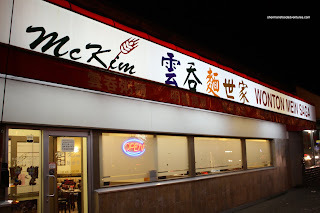 McKim Wonton Mein Saga resides only a few blocks from his place and we decided to drive there. Yah, when it comes to intergalactic travel, you need to use a vessel! For way past 8:00pm, the place was hopping much like Mos Eisley's Cantina. Rather than aliens and space bandits, it was filled with hungry diners . We were lucky to snag the last large table in the house. I know we were there to try out the wonton noodles; but that wouldn't have filled us up, so we ended up getting the set dinner for 5 which includes choice of 5 dishes, a complimentary BBQ duo, daily soup, rice and dessert. 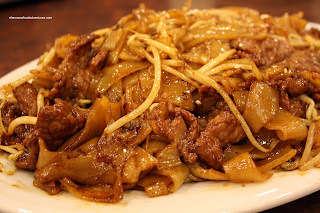 For the kiddies, we got them Stir Fried Rice Noodle with Beef. Due to our random ordering of dinner entrees mixed with noodles and congee, other than our daily soup, everything else arrived out of order. The first thing to arrive was the rice noodle (which suited us fine actually, kids needed to eat anyways). Generally, this dish scares a lot of people because it comes glistening like a teenage boy's forehead. You see, to keep the rice noodles from sticking to the wok, copious amounts of oil is needed. However, in this case, it wasn't too bad and the dish was pretty well executed. Noodles were soft while still retaining their original shape, beef was tender and there was just enough dark soy to give some colour and flavour. Our complimentary BBQ dish consisted of BBQ Pork and BBQ Duck. Unfortunately, the pork was a little on the dry side even though there was a goo d amount of marbling. I guess it could be due to the end of the day? Moreover, it was a bit difficult to properly judge the BBQ duck since we got the wing piece. Usually, that is the driest, most stringy part of a BBQ duck. So I'll just leave it at that. Costanza's favourite dish by far is the "Say Gwei Dow", which Spicy Beans with Ground Pork, so it was a given he'd order it. 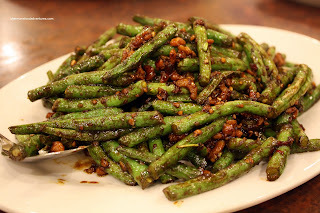 This was pretty good with perfectly oil-blanched green beans with a spicy/savory mix of pork and dried shrimp. 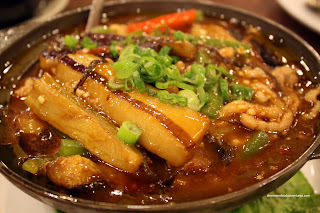 To satisfy our vegetable quotient a bit more, albeit un healthy ways of cooking it, we got the Eggplant Hot Pot. The eggplant was soft while not becoming mush in the sizzling hot pot. Once again, this is achieved by the dreaded oil-blanching. So evil; yet so good. "Luke, join me on the Dark Side!" Anyways, the sauce was a tad spicy and mostly sweet. It was great with rice, especially with the nice gloss from the grease. Once again, we have the Shrimp and Eggs. Yah, you see this every episode here on the Food Aventures. It's like that cursed Jar Jar Binks; you can't seem to get rid of him, unless we're talking about episode 4, 5 or 6. 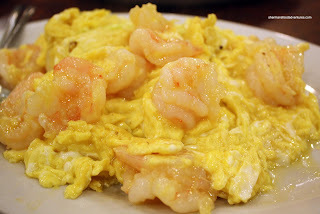 The good thing about this dish was the plethora of large crunchy shrimp and soft "just-cooked" eggs. The bad part was the copious amount of sodium. These were some salty eggs! One dish we normally do not order when we go out is the Steamed Minced Pork with Salted Fish. This is traditionally found in home cooking at many Chinese households. This is a classic comfort dish that goes well with a large bowl of rice. However, this particular version was plain awful. We thought that this dish was akin to eating steamed wallpaper paste with some salt. I can't even begin to describe the texture of it. Is there such thing as no texture? If someone blindfolded and asked us what we were eating, I wouldn't have guessed it was meat of any sort. My guess is they got lazy and pureed the poor meat rather than hand mincing it with 2 cleavers. Thus, the lack of meat texture. I would've preferred to be frozen in carbonite than eat this dish again. Luckily for us, the Tofu and Fish Hot Pot was very good, so we just ignored the last dish for the rest of the meal. 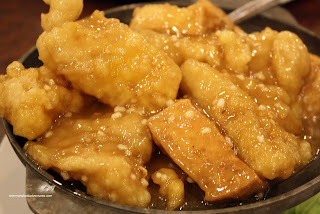 Big, perfectly fried, flaky pieces of fish mingled with equally well-fried soft tofu in a garlicky sauce. The hot pot was plentiful in ingredients and tasty as well. 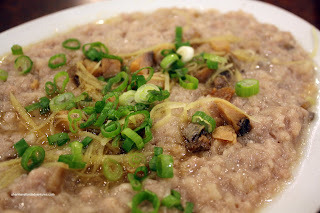 As for the Preserved Egg and Salted Pork congee, it was pretty good. 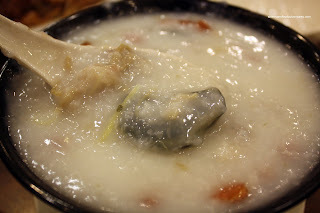 The congee itself was thick and only moderately seasoned. There was enough ingredients adequately fill most spoonfuls. Now, for the main event, the Wonton Noodles. The restaurant's claim to fame. On the surface, it looked pretty good and one sip of the soup, it tasted like it should. One bite into the decent-sized wonton revealed cold-water shrimp that exuded an essence of sesame oil. A chopstick full of noodles and... uh... hmm... not exactly what I was hoping for. The noodles lacked the "bite" we looked for in an al dente wonton noodle. Rather, the texture was more like a regular shrimp noodle (haw gee mein). Definitely not as good as Nancy Wonton House, McNoodle and Ho Yuen Kee. Not a bad bowl of wonton noodles; but I was hoping for more. It's like watching Hayden Christiansen in hopes for good acting... So the wonton noodles weren't bad per se; yet it didn't live up to the "saga". Most of the other food was spot-on, other than the steamed wallpaper paste, er... pork. So, it's probably worth another look or a "Return of the Blogger". I have a strong feeling that paper pulp was used in the steamed meat patty... meat fillers always scare me. I used to go here a lot because they were supposedly famous for their wontons and it's close to my house. 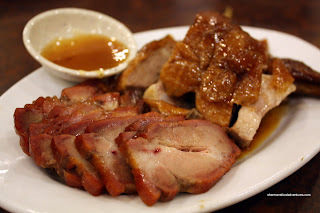 At first, most of the food was pretty reliable cantonese style food, then the quality started to go downhill over time. I don't know if they changed chefs or what, but I don't go here anymore after having a few disappointing dishes in a row. McKim's would be #2 on my list for won tons. The #1 king of won tons is Tsim Chai Noodles on Westminster Highway across from the Richmond Public Market. Their shrimp won tons are double the size and their noodles are the 'al dente' you're looking for. My mouth is watering just thinking about them (I was there for lunch today). Haha Mel... yah it did resemble paper pulp! Holly, yah I agree with you, the food really didn't impress me, it was okay. Gary, thanks for reminding me of Tsim Chai. Heard about them, haven't tried. May need to edit this post after a visit! i have a chemical burn in my mouth (long story) and your pictures are making me crazy. i want to combine the green beans with the fish and tofu... and FEAST. as soon as i can eat again, i'm making up for lost time! hey, thanks for the info on my last comment. i didn't know about the oakridge jewish community... interesting! LOL Pattie... Yah, I wouldn't know either!